Our exciting Active Athon is just around the corner on Friday 12 June. We encourage all students to raise as much sponsorship money as possible to make this major fundraiser a successful event for our school. The more money we can raise as a school the more developments we can make to our natural play spaces around the oval. We have some fantastic raffle prizes already in our front office. Come and have a look at the great display. We welcome any child friendly donations for the raffle, from our school community. If you would like to donate, please drop off your donation to the front office. 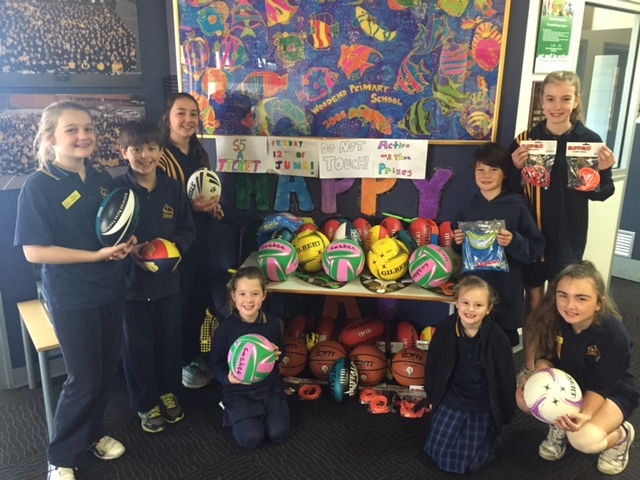 Pictured are some of our Woodend students who are excited about the Active A-thon which is less than 2 weeks away. Every student in our school will have an opportunity to complete our engaging and exciting Active A-thon. Don’t forget on the day we are encouraging all students to dress up in their favourite sporting attire on 12 June. Matt Hehner and the Active – Athon student committee.